Palms are beautiful plants that can spruce up any garden or living space and add a tropical feel no matter the season. Palms are also surprisingly easy to take care of and maintain. There are also palm varieties that grow quickly while some palms can withstand cold winters and extremely hot summers. One important maintenance and care requirement of palm is watering. You will need to know the exact water requirements of your specific palm however as palms have different needs when it comes to water and moisture. Watering your plant by simply drenching the leaves and top soil with your garden hose is the opposite of deep watering. All the layers of the soil will not be able to receive a good amount of water to stay moist, especially during warmer seasons. Deep watering is a process where you'll slow drip water over the soil. Ideally, if you have a 45 litre bag palm, you should give it the equal amount of water. When watering, slow drip that amount over a 1 or 2 hour period. This will give the soil enough time to absorb the water and moisture. Unless it's a newly planted, watering every day is overdoing it. A new palm should be watered everyday on its first week, switch to every other day the following and then settle for 3 times a week on the third. For more established palms, watering should be done only 2-3 times per week. Some palms would even require watering only if the top 1-2 inches of the soil has dried out. 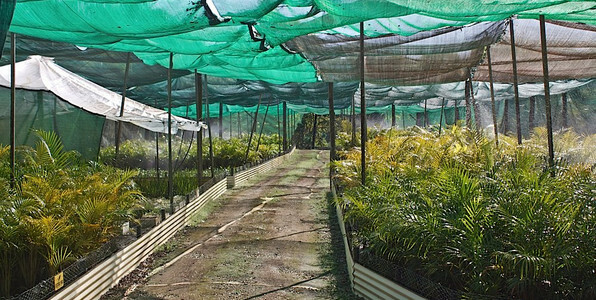 Palms do most of their growing during the summer's warm months so they will need a lot of moisture to keep up with the expelling of energy they require to grow. Water frequently during this period to maintain moisture content just below the surface. Winter sees little growth and activity for palms so they won't need as much water. Water also cools the soil so during colder months, they need to stay as warm as possible to survive. The best time for watering is in the early mornings or late afternoons in summer and earlier in the day during winter. Avoid accidentally having sunburnt fronds by watering when it's not the hottest part of the day. Early mornings are ideal because it ensures that the soil will stay moist even as the sun is hottest. Water in late afternoon refreshers your palm after a hot day. The soil also has more time to absorb the moisture without having the threat of a warm afternoon following. One of the most common reasons that palms do not survive is because of overwatering. The most common reason is not watering at all. Many people make the mistake of watering their palms too frequently causing several diseases to gain a foothold on an otherwise healthy plant. Root rot is one of the irreversible diseases that a palm can get from overwatering. There is little that can be done to remedy root rot, especially in its advanced stages and it is very difficult to detect. Be sure to know what your palms specific water requirements are in order to prevent this from happening.